Do you want to hide your online activities from other users of the same computer? Want to keep computer clean and healthy from deluge of temporary files, logs and cached files? ‘Wipe’ is a free application that does same with perfect ease. It can be used to clear user browsing history, clean index.dat files, remove cookies, cache, logs, delete temporary internet files, autocomplete search history and any other tracks that user leaves after using PC. This program list number of files of each type like recent documents like, clipboard data, internet files etc. You can select file type that should be cleared and proceed with deletion process. 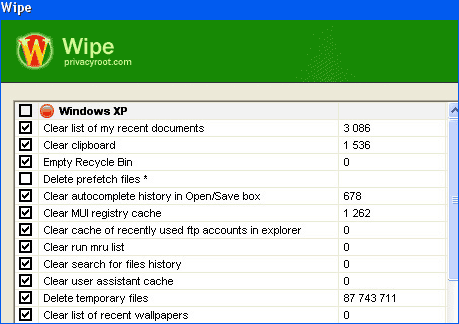 It has neat interface with access to lot ofÂ files and data that should be wiped off. Download Wipe [2.68 MB] – it works fine on Windows XP, Vista and support number of popular web browsers like: IE, FireFox, Opera and Chrome. Very handy to ‘wipe’ out details that you don’t want to reveal!